For patients suffering from chronic back pain, there are instances where medical management, traditional anesthesia techniques, or traditional spinal surgery either are not effective, or are not an option. The afflicted can become desperate and may be told there are few alternative solutions. Since these alternative solutions are invasive, often need revision, and do not work for everyone, they should only be considered as a last resort. Spinal cord stimulation (SCS) is a pain management strategy that blocks pain messages by sending an electrical impulse to selected nerves in the spinal cord. 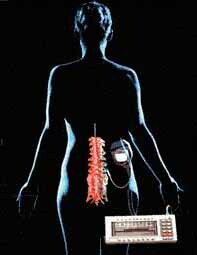 Small electrodes are implanted in the spine and a generator is placed just under the patient’s skin. A programmable transmitter is worn by the patient and communicates with the receiver via radio waves. The generator is programmed to allow a certain number, type, and pattern of electrical impulses to be fired by the electrodes within a specific time frame. Patients can turn off the system throughout the day by turning off the power source, and a neurosurgeon can adjust the amount, type and pattern of impulses by adjusting the generator. If 50 to 70 percent pain relief is achieved with trial placement of the stimulator, then a permanent stimulator may be implanted. If pain is limited to the spine, an intrathecal pump can be used to deliver medication directly into the spinal fluid. Normally, for pain medication to reach the spinal fluid, it must be given in great quantities, causing significant side effects. An intrathecal pump can be implanted under the skin in the side of the abdomen. The medication is delivered directly to the site of the pain and in much larger quantities than would be tolerated if taken orally. The pump is refilled with medication through a syringe every four to twelve weeks and is programmed to deliver specific amounts of medication throughout the day. The amount of medication that flows through the catheter can be reprogrammed using radio telemetry from a computer and electronic wand. In those cases where the pump is successful, up to 65 percent relief can be obtained. As is the case with spinal cord stimulators, in the event of complications or failure to retain relief, the pump can also be removed. These two techniques are not the first option for patients suffering from back pain because we are not ‘fixing’ the problem, just stopping the feeling of pain. In many instances, the feeling of pain is transferred throughout the body by nerves. The pain message originates in the injured tissue, travels through the spinal cord, and is then transferred up into the brain. The idea behind pumps and stimulators is that those signals can be interrupted, either through the use of medication or electrical stimulation. Both the patient and the clinician need to keep in mind, however, that the same factors that resulted in failure of other treatment options are still present. This means that even if initial relief is obtained, symptoms can reoccur. While the advantage of SCS and pumps is that they can be tested in a trial mode, are non-destructive, and are reversible, a major disadvantage is that no one wants to follow up on someone else’s work. This means if the device still does not work after revisions and replacement, then finding someone who is willing to remove the device permanently can be a problem. It can also be difficult to find a doctor willing to offer any additional treatment because they feel options are limited. Fortunately, solutions are still available. They include getting back to basics — finding the root cause of the problem and fixing what’s wrong. Expect to look for things that have been missed from the start, such as hidden infection, torn ligament, or ischemia (lack of blood flow). With patience and a willingness to look at all options that interfere with wellness, favorable results can occur, including both removal of unwanted devices and pain relief. At Piedmont Physical Medicine & Rehabilitation, we work closely with you in order to help assure a favorable outcome irrespective of which method of treatment is pursued. Effective pain relief can occur with innovative solutions that are designed to get you back to your life.